side effects, and may be used anytime and anywhere by anyone." Currently the largest program is TaiChiEasy™, an “evidence based” program using gentle movement, breath practice, self‐applied massage, and meditation. Trained TaiChiEasy™ Practice Leaders support end-users in lowering risk for preventable chronic diseases, improving sleep problems, managing pain, speeding rehabilitation, reducing depression and anxiety, assisting in recovery from addiction, and more. Tai Chi Easy™ is designed to improve the quality of life for people of all ages– whether well or unwell. This includes those who may be dealing with disease, chronic pain and health conditions, limited mobility, deficient immune systems, anxiety or depression. Using simplified Tai Chi based on the four major recognized styles of Tai Chi, this program is straightforward and highly adaptable resulting in empowerment in self-care and self management skills. This style includes steps and exercises that improve mobility, breathing and relaxation. The movements don't require deep bending or squatting, which makes it easier and more comfortable to learn. In addition, the instruction includes seated and standing stationary versions of all the movements. This encourages people of all levels and abilities to learn and participate. Tai Chi Easy™ is a nationally branded program, that is evidence-based and implemented in wide array of facilities and institutions. Those who complete the Tai Chi Easy™ Practice Leader Training are empowered to lead the self-care and health promotion practices in numerous environments. Many agencies, institutions and corporations are seeking this very type of program for stress resiliency, disease management, fall prevention, and employee wellness. 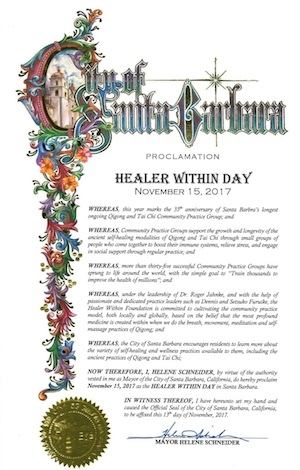 The Healer Within Foundation (HWF) celebrated thirty-five years of the Santa Barbara Weekly Community Practice - thirty-five years of Qigong and Tai Chi for public benefit in Santa Barbara -- ALSO -- the HWF Nationwide Network of Community Practice, now in over twenty communities. The Healer Within Foundation Community Practice Group Celebration took place at the historic Granada Theater in downtown Santa Barbara on November 15th. 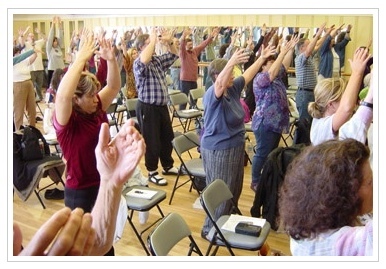 The event was attended by over 100 Tai Chi Easy™ and Qigong enthusiasts. Those in attendance included members of the Santa Barbara practice group, several HWF Board members, special guests, and a large contingent of students from the IIQTC Level 2 training which also took place that week. The celebration honored the 35 year history of the Community Practice Group in Santa Barbara and the nearly 25 years of volunteer leadership by Dennis Furuike. Special recognition was also given to Setsuko Furuike and Rhonda Richey for their volunteer efforts contributing to the longevity and success of the group. These are some of the HWF luminaries at the event along with over one hundred citizens and community activists including the Mayor of Santa Barbara Who proclaimed November 15, 2017 -- Healer Within Day! 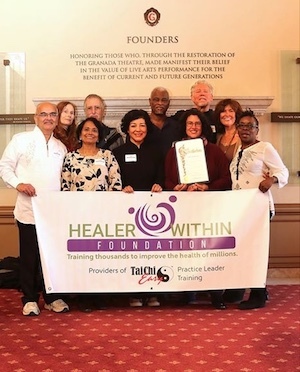 The Healer Within Foundation is a 501(c)(3) corporation dedicated to advancing the community-based implementation of Qigong/Tai Chi and other self-healing body-mind-spirit practices. The Foundation collaborates with individuals, government agencies and organizations to sponsor education and training programs, community-based practice and research on the health benefits of these practices. The Healer Within Foundation is currently living out this mission through the TaiChiEasy™ Dissemination Project which trains Practice Leaders to introduce the TaiChiEasy™ form and teaching methods created by Roger Jahnke, O.M.D. in communities throughout the world. Tai Chi Easy™ Practice Leader Training is 25 hour training that empowers motivated individuals to share the self-care practices of Qigong and Tai Chi in a widely diverse variety of environments and institutions. Many social agencies, educational institutions and corporations are seeking this very type of program for wellness programming - including social service agencies, YMCAs, schools, churches, spas, fitness centers, seniors centers. Recently, the National Council on Aging (NCOA) and the National Emphysema/COPD Association (NECA) have become proponents of widespread implementation of Tai Chi Easy™. In the new era of complementary and mind/body medicine, Tai Chi and Qigong are rapidly ascending to the status of wellness power tools. The material learned in the Tai Chi Easy™ curriculum is a subset of the 200-hour teacher certification program. 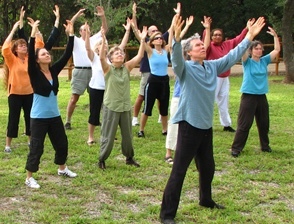 Tai Chi Easy™ is especially suited for those whose primary career is set but who wish to add Tai Chi Easy™ to the skills they bring to their work already -- teachers, senior activities coordinators, fitness coaches, yoga teachers, social workers, occupational therapists, faith based health ministry coordinators, nurses, wellness coordinators, spa fitness coaches, wellness coordinators, health promotion professionals, and life coaches. It is not unusual for a Tai Chi Easy™ Practice Leader to continue training to become an Integral Qigong™ Community Qigong Practice Leader, and ultimately a Certified Integral Qigong and Tai Chi Teacher through the 200 hour Institute of Integral Qigong and Tai Chi Teacher certification program (iiqtc.org).